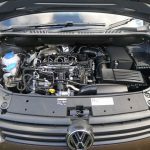 A 1.6 cc diesel engine Caddy with manual gearbox, this Volkswagen is a fabulous vehicle to drive providing a smooth run with plenty of power. 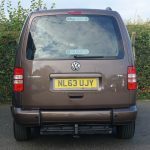 Plenty of extras too on this vehicle including roof rails, height adjustable drivers seat and parking sensors to name a few. 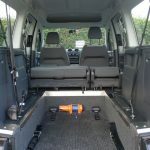 Please check out the specification section included on this webpage for a full list. 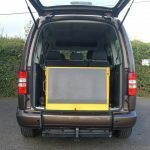 The conversion is by Automotive and adapted to a very high standard. 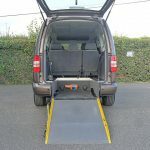 The lowered floor (carpeted) creates the extra height required to accommodate a wheelchair user and the two piece powered ramp provides the means of getting the wheelchair/wheelchair user into the vehicle with ease. 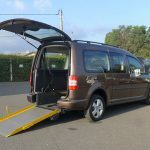 If you struggle to push a wheelchair up any inclines then this vehicle has been fitted with a winch that pulls the wheelchair up the ramp and into the wheelchair location making it effortless – a must in some cases. 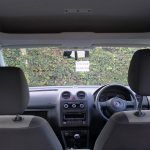 Once on board, the wheelchair restraint and safety belt systems come into play and ensure that the wheelchair user is safe and securely fastened in the car before setting off on any journeys. 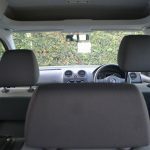 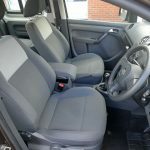 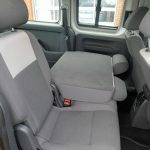 You will notice from the photographs that the rear row of seats can be adjusted in various ways and if all are folded forwards the wheelchair user can enjoy more space and more all round visibility. 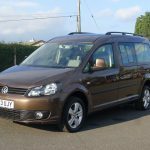 A great car for family use due to the number of seats on board. 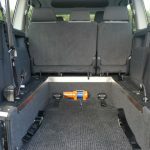 Many storage areas which are always useful to keep the vehicle nice and tidy when out and about. 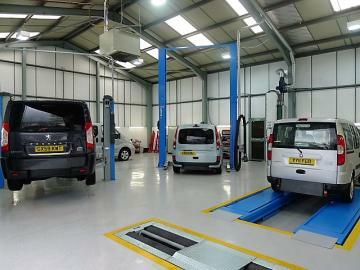 All of our quality vehicles come with 12 months MOT, 12 months warranty and are serviced/valeted in our very own state of the art Service Department before being delivered to their new homes. 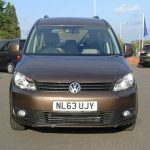 Give us a call if you need any guidance/advice and speak to one of our experts.